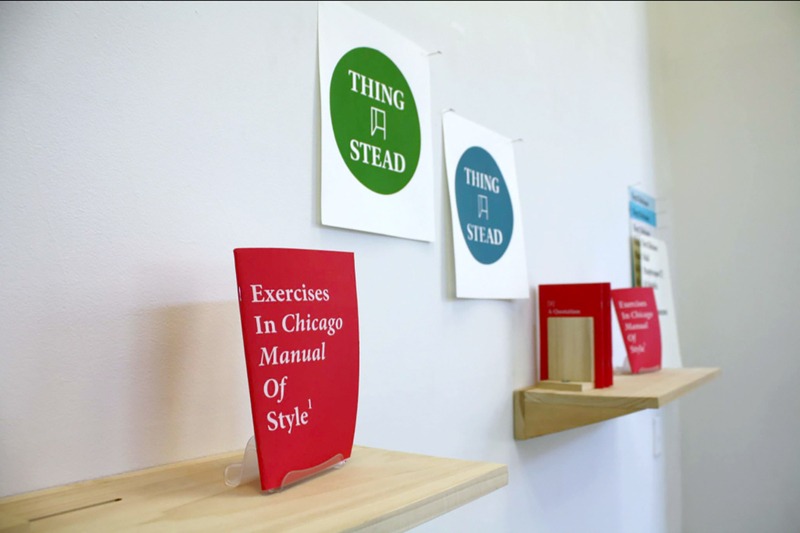 Next time you’re on or near the UIC campus, stop into Gallery 400 and pick up a copy of ThingStead, PhD art history candidate Chris Reeves and MFA candidate Aaron Walker’s small-press print installation project in the lobby. The two took over the space, which is already bustling with daily foot traffic, and turned it into a checkout lane where patrons can peruse and “take-away” a copy of their latest publication. Each booklet is composed of “reimagined drafts and excerpts” from artists and writers on a specific topic, theme or work to create an amalgamation of ideas or “excursus,” as they like to call it. “We like to imagine ThingStead as an inevitable place for artists and writers to present something that is maybe outside of their typical purview or to experiment,” says Reeves. “The self-published booklet provides a handy platform for these collaborative projects that combine some of the rigor of historical, critical research with some of the invention of art-making, a hybrid that we are both fond of tinkering with,” Walker adds. There are five books in the collection; each booklet is released twenty days after the last. The booklet currently up for grabs is “Oulaf Pataphysique/Oulafelix,” by Arthur Brum, which explores elements of pataphysics in the form of a travel memoir. Think metaphysics with a short attention span, as the story often purposefully gets sidetracked, like one often does when traveling. Reeves believes the books to be creative art historical writing, or poetic research. Given his and Walker’s deep interests in art, writing and research, the publication became a natural fusion for all of those things. The term thing-stead comes from an old Norse word for a public meeting place.